Here is the list of the hotels near Fourques. Book your hotel near Fourques today, Tuesday 14 May for the best price, reservation and cancellation free of charge thanks to our partner Booking.com, leader in on-line hotels reservation. Below here is the list the 50 closest hotels of Fourques, sortable according your criteria. You will find the position of these accommodations on the Fourques hotels map. Boasting a private pool and pool views, Villa Del Sol is located in Fourques. Guests staying at this holiday home have access to a fully equipped kitchen. With 3 bedrooms, this holiday home has a terrace, a living room and a flat-screen TV with DVD player. There is a bathroom with a bath. The holiday home offers an outdoor pool. Guests can relax in the garden at the property. Roses is 48 km from Villa Del Sol, while Perpignan is 16 km from the property. The nearest airport is Perpignan - Rivesaltes Airport, 19 km from the accommodation. Jolie chambre, vue sur piscine is situated in Tordères and offers a garden. Guests can go for a swim in the private pool and enjoy the free WiFi. A continental breakfast is served every morning at the property. The bed and breakfast offers a terrace. Guests at the property can enjoy table tennis on site, or go cycling or hiking in the surroundings. Perpignan is 24 km from Jolie chambre, vue sur piscine, while Collioure is 37 km from the property. Perpignan - Rivesaltes Airport is 27 km away. Ferienhaus mit Pool Tordères 100S is located in Tordères. The accommodation is 24 km from Perpignan. This holiday home has a living room and a fully equipped kitchen with an oven. Collioure is 37 km from the holiday home. The nearest airport is Perpignan - Rivesaltes Airport, 28 km from Ferienhaus mit Pool Tordères 100S. Boasting an outdoor pool and pool views, Villa Moulin de Canterrane is located in Castelnou. Providing free WiFi, the property also has barbecue facilities. This air-conditioned holiday home comes with 3 bedrooms, a satellite TV, and a kitchen with a dishwasher and a microwave. Perpignan is 22 km from the holiday home, while Collioure is 39 km from the property. Perpignan - Rivesaltes Airport is 28 km away. Between the mediterranean sea and the Pyrennees, Le mimosa Corsavy is an apartment in Montauriol with access to free bikes and barbecue facilities. Free WiFi is offered throughout the property. The apartment is composed of a fully equipped kitchen, and 1 bathroom. Free private parking is available at the apartment. A buffet breakfast is served every morning at the property. Le mimosa Corsavy offers an outdoor pool, a sauna and a hot tub. Other facilities include a table tennis table and a pétanque strip. Perpignan is 19 km from Le mimosa Corsavy, while Collioure is 30 km away. Perpignan - Rivesaltes Airport is 22 km from the property. Offering free WiFi and city views, Location vacances is an accommodation situated in Villemolaque. The air-conditioned accommodation is 46 km from Roses. The apartment is located on the ground floor and is equipped with 2 bedrooms, a flat-screen TV and a fully equipped kitchenette that provides guests with an oven and a microwave. The bathroom features a shower, free toiletries and a hair dryer. If you would like to discover the area, hiking is possible in the surroundings. Cadaqués is 49 km from the apartment, while Perpignan is 13 km from the property. The nearest airport is Perpignan - Rivesaltes Airport, 17 km from the property. Offering a seasonal outdoor pool and views of the garden, La Pantoufle Verte is set in the countryside in Montauriol, 25 km from Perpignan. Free WiFi is featured throughout the property and free private parking is available on site. There is luggage storage space at the property. Evening meals are available upon prior request. You can play table tennis and darts at this bed and breakfast, and the area is popular for hiking. The nearest shops are a 10-minute drive away. Thuir is 14 km from La Pantoufle Verte, and has supermarkets and restaurants. Collioure is 37 km away, while Figueres is 61 km from the property. The nearest airport is Perpignan - Rivesaltes Airport, 30 km from the property. Located in Caixas, Mas de la Fariole offers accommodation with a private pool and mountain views. This holiday home features accommodation with a terrace. The holiday home is composed of 1 bedroom, a fully equipped kitchen, and 1 bathroom. Continental and Italian breakfast options are available each morning at the holiday home. Perpignan is 28 km from Mas de la Fariole, while Collioure is 42 km away. The nearest airport is Perpignan - Rivesaltes Airport, 32 km from the accommodation. This hotel welcomes you in its lovely setting amongst the vineyards of Catalan and the Pyrenees Mountains. It offers comfortable and quality accommodation. The Hotel du Village Catalan is located at the motorway A9 between Perpignan and the Spanish border. Guestrooms are spacious, bright, soundproofed and air-conditioned to provide you with a relaxing living space. Wi-Fi internet access is available in the hotels public areas and is free of charge. The spacious pool of the Hotel du Village Catalan is set in a beautiful garden promising relaxing moments for the whole family. Also, guests will enjoy a continental breakfast served in the air-conditioned breakfast room or on the shaded terrace by the pool. Private parking in garages is available at an additional cost. Offering a restaurant and a shaded terrace, Hotel Cortie is located in Thuir. Free WiFi is available. Perpignan is 15 km away. Rooms here will provide you with a flat-screen TV, air conditioning and a terrace. Featuring a bath or shower, private bathrooms also come with a hairdryer. You can enjoy a garden view from all the rooms. Extras include a patio, balcony and laptop. At Hotel Cortie you will find a bar and a shared lounge. Guest can enjoy karaoke nights onsite (at an extra cost). The property offers free parking. Perpignan-Rivesaltes Airport is a 20-minute drive away. Set in Thuir, this 1850s building has been remodeled in a contemporary design. It features a saltwater pool and a large garden. Rooms are located in a modern building and all give direct access to either the patio or the garden. Each room has a flat-screen TV and free WiFi. Each shower room includes a hairdryer, free toiletries and slippers. There is an onsite restaurant. In the summer, guests can enjoy the patio while in winter they can relax by the fireplace. La Fauvelle is 18.6 km from Perpignan or a 25-minute drive from Perpignan-Rivesaltes International Airport. The medieval castle and village of Castelnou is 6 km away. Free private parking is available on site. Holiday home Mas Julia is set in Montauriol. This holiday home offers an outdoor pool and complimentary WiFi. The holiday home includes a kitchen with a dishwasher and an oven, as well as a coffee machine. Perpignan is 29 km from the holiday home. The nearest airport is Perpignan - Rivesaltes Airport, 33 km from the property. Located 5 km from Le Boulou Joa Casino, Team Holiday - Camping Mas Llinas offers accommodation with a terrace and free WiFi. All units comprise a seating area with a sofa, a dining area, and a fully equipped kitchen with various cooking facilities, including a microwave, a toaster and a fridge. A stovetop and coffee machine are also available. A continental breakfast is served each morning at the property. The camping offers an outdoor pool. A children's playground is available for guests at Team Holiday - Camping Mas Llinas to use. Perpignan - Rivesaltes Airport is 32 km from the property. Hotel Restaurant La Garenne in Tresserre has 2-star accommodation with a seasonal outdoor swimming pool, a garden and a terrace. With free WiFi, this 2-star hotel offers a 24-hour front desk and a shared lounge. Guests can grab a bite to eat in the in-house restaurant or relax in the bar. At the hotel, every room includes a desk and a flat-screen TV. Every room is fitted with a private bathroom with a bath and selected rooms also offer a balcony. All units feature a wardrobe. A continental or buffet breakfast can be enjoyed at the property. Perpignan is 19 km from Hotel Restaurant La Garenne, while Collioure is 25 km away. The nearest airport is Perpignan - Rivesaltes Airport, 26 km from the accommodation. La Figuera B&B is located 20 km from Perpignan in the medieval village of Castelnou. The property offers a terrace with mountain and village views, as well as a communal lounge with a TV, fireplace and free Wi-Fi. The B&B has double and triple rooms, each with a private bathroom with shower and free toiletries. Certain rooms also offer mountain views. A continental breakfast is served free of charge, including homemade jams and pastries. Castelnou has a restaurant, Le Coin Catalan, 140 metres from the property. Serveral bars and restaurants can also be found in Thuir, a 10-minute drive away. Castelou is a car free village but a car park is located just outside, 300 metres from the B&B. You may be interested to visit the beaches at Canet Plage, 35 km from Castelnou. Apartment Oms Preferred hotel ! Mas Picagnol provides accommodation with a kitchen, situated in Oms. Free WiFi is featured. Offering a terrace, specific units are air conditioned and feature a dining area and a seating area with a flat-screen TV. 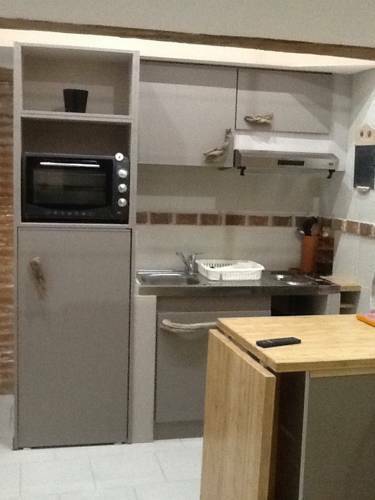 An oven and microwave are also offered, as well as a coffee machine. A continental breakfast is served each morning at the property. The apartment offers a seasonal outdoor pool. Mas Picagnol offers a children's playground. Perpignan is 32 km from the accommodation. The nearest airport is Perpignan - Rivesaltes Airport, 35 km from Mas Picagnol. With an outdoor swimming pool, this hotel is located in a traditional Catalan stone building dating from the 11th and 15th centuries. It is set in the heart of the Languedoc-Roussillon countryside, a 5-minute drive from the village of Thuir. The luxury and modern guest rooms offer views of the garden or the Mediterranean patios. Free Wi-Fi, a flat-screen TV with international channels and en suite bathroom with bathrobes are available in each of the rooms. Breakfast is served each morning at the hotel and can be enjoyed in the patio or in the comfort of guests’ rooms. The hotel also provides a wine cellar, and snack service offering regional products. During their stay guests are invited to relax in the lounge, or on one of the shaded patios. Free private parking is offered on site and staff can help guests organize excursions in the local area. Hotel Le Boulou Preferred hotel ! Ideally located at the foot of the Albères mountains, with a panoramic view of the Néoulous and the Canigou, Le Neoulous is the perfect place for a relaxing mountain break. Choose among 47 South-East and South-West oriented rooms in which you will find all the amenities you need for a relaxing stay: a functional bathroom, telephone and television. Take a refreshing dip in the hotel's private swimming pool surrounded by a lush garden, unless you prefer to walk down to the river or do some mountain sports. The hotel has a restaurant serving traditional semi-gastronomic food, a bar, a large private parking and modern seminar rooms with wireless internet access. Apartment Le Boulou Preferred hotel ! Maison de Village Le Boulou is set in Le Boulou. The property has city views, plus is 1.6 km from Le Boulou Joa Casino. The 1-bedroom apartment features a living room with flat-screen TV, a fully equipped kitchen with oven, and 1 bathroom with a shower. The nearest airport is Perpignan - Rivesaltes Airport, 31 km from the property. 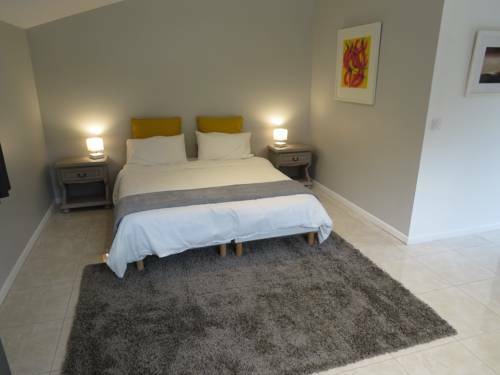 Guest accommodation Banyuls-dels-Aspres Preferred hotel ! Mas Natura is a holiday home featuring 2 accommodation in Banyuls-dels-Aspres with access to free bikes. These self-catered accommodation features access to a pool, a garden and free private parking. Both accommodation have a kitchen with a dishwasher and an oven, and a bathroom with a shower, a hairdryer and a washing machine. A flat-screen TV is also featured. The holiday home offers an outdoor pool. There is a BBQ facilities and a terrace at this property and guests can go cycling nearby. Bike rental is available upon reservation. Many activities can be enjoyed in the area, such as fishing, playing golf, horseriding and hiking. Argelès sur Mer and its beaches is 18 km from Mas Natura, while Amélie les Bains and its thermal baths is 22 km away. The nearest airport is Perpignan - Rivesaltes Airport, 19 km from the accommodation. Featuring barbecue facilities, Holiday home Traverse Du Soler offers accommodation in Thuir with free WiFi and garden views. Guests staying at this holiday home have access to a fully equipped kitchen. The holiday home features a satellite TV and 3 bedrooms. Perpignan is 14 km from the holiday home. The nearest airport is Perpignan - Rivesaltes Airport, 18 km from the property. Hotel Le Centre is a family-run hotel on the main road of Le Boulou, near the historic and shopping districts. It offers a warm atmosphere and free Wi-Fi access. Rooms are comfortable and are being refurbished with new bedding. The multilingual owners will try their best to help you make the most of your stay. They can speak French, English, Italian, and Spanish. Hotel Le Centre is a good location from which to discover the Pyrenees area and Cathar castles. In the heart of Roussillon between the sea and mountains that border Spain, the Inter-Hotel Perpignan Sud Le Grillon d'Or provides modern accommodation and free Wi-Fi. Recently renovated, all rooms at the Inter-Hotel Le Grillon d'Or include a TV, telephone and en suite facilities. Some offer air conditioning and view of the river and forest. A continental breakfast can be enjoyed in the guestrooms while a buffet breakfast is available either in the breakfast room or on the terrace. Additional services at the Inter-Hotel Perpignan Sud Le Grillon D'or include a buffet dinner and a heated outdoor pool (open from May to September). Parking is available at additional cost. Le Richelieu is situated in the centre of the picturesque village of Le Boulou. It offers well-equipped rooms with free Wi-Fi internet access and provides free parking. The owners of Le Richelieu offer a warm, family welcome and will ensure you have a pleasant stay. Spend time relaxing with friends and family in the hotel’s modern bar. Soak up the sun on the pleasant outdoor terrace. Surrounded by natural beauty, Le Richelieu is only 15 kilometres from Spain and the Albères Mountains. Set in Banyuls-dels-Aspres, 42 km from Roses, Le Jardin de l'Olivier is a homestay featuring a seasonal outdoor pool and views of the pool. Free private parking is available on site. Every room includes a flat-screen TV. Some rooms feature a seating area to relax in after a busy day. A terrace or balcony are featured in certain rooms. The rooms have a private bathroom fitted with a bath. Le Jardin de l'Olivier features free WiFi throughout the property. Cadaqués is 45 km from Le Jardin de l'Olivier, while Perpignan is 15 km away. The nearest airport is Perpignan - Rivesaltes Airport, 20 km from the property. Located 1.3 km from Le Boulou Joa Casino, Clos Fructidor offers free WiFi and units equipped with a kitchen, seating area and flat-screen TV. Each unit is equipped with an oven, microwave, a coffee machine, as well as a toaster and kettle. Some units feature a dining area and/or a terrace. The apartment offers a barbecue. Guests can go cycling or relax in the garden. The nearest airport is Perpignan - Rivesaltes Airport, 30 km from the property. Set on a 25-hectare vineyard, this guest house is just 10 km from the Spanish border. Guests can relax by the outdoor swimming pool or visit Argelès-sur-Mer, 12 km away. The rooms at Domaine de Nidolères have views of the courtyard and a TV. Each one also has free Wi-Fi access. You can enjoy the continental breakfast on the terrace and Catalan cuisine in the restaurant. Additional facilities at the guest house include a sauna and a hot tub. Free private parking is available on site. Other activities in the area include horse riding at a nearby equestrian centre or visiting Perpignan, 15 km away. Located in Saint-Jean-Pla-de-Corts, Asile D'or provides accommodation with a private pool and mountain views. This holiday home offers accommodation with free WiFi. This holiday home features 5 bedrooms, a kitchen with a dishwasher and a oven, a flat-screen TV, a seating area and 1 bathroom with a bath. Perpignan is 27 km from the holiday home, while Collioure is 29 km from the property. The nearest airport is Perpignan - Rivesaltes Airport, 33 km from the property. Located in Oms, mas Fontanes offers BBQ facilities, free WiFi, a shared kitchen, and a shared lounge. The property has sea and mountain views. The holiday home includes a kitchen with a dishwasher and an oven, as well as a coffee machine. The holiday home also comes with a seating area and 4 bathrooms. The holiday home offers a sun terrace. Perpignan is 35 km from mas Fontanes, while Collioure is 47 km from the property. The nearest airport is Perpignan - Rivesaltes Airport, 38 km from the accommodation. Holiday home Lotissement de l'Auxineill is located in Castelnou. The holiday home features pool views and is 19 km from Perpignan. With free WiFi, this 3-bedroom holiday home offers a satellite TV, a washing machine and a kitchen with a dishwasher and oven. The holiday home offers an outdoor pool. Barbecue facilities are at guests' disposal. Collioure is 39 km from Holiday home Lotissement de l'Auxineill. The nearest airport is Perpignan - Rivesaltes Airport, 25 km from the accommodation. Featuring free WiFi throughout the property, La Gentolière offers pet-friendly non-smoking accommodation in Pollestres, 49 km from Roses. Free private parking is available on site. All rooms come with a flat-screen TV. Certain rooms include a seating area for your convenience. You will find a coffee machine and a kettle in the room. All rooms are fitted with a private bathroom. Perpignan is 7 km from La Gentolière, while Collioure is 22 km from the property. Perpignan - Rivesaltes Airport is 11 km away. Featuring free WiFi and an outdoor pool, La Planquette offers pet-friendly accommodation in Castelnou, 4 km from the medieval city. Free private parking is available on site. The property offers a 2500 m² fenced garden and views of the Canigou mountain. La Planquette features a suite on the upper floor and a private shower room and toilet. On the ground floor, the double room has a private access and opens onto the terrace, garden and pool. There is also a bathroom with a bath and shower and a separate toilet. The breakfast includes homemade jams, seasonal fruits and fruit juice. Guests have access to a refrigerator and can enjoy a picnic on the garden's terrace. Perpignan is 19 km from La Planquette, while Collioure is 45 km from the property. The nearest airport is Perpignan - Rivesaltes Airport, 24 km from the property. Joli mas en pierre is situated in Pollestres. This holiday home features air-conditioned accommodation with a terrace and free WiFi. The holiday home includes a kitchen with an oven and a toaster, as well as a coffee machine. A TV with satellite channels is available. Perpignan is 9 km from the holiday home. Perpignan - Rivesaltes Airport is 16 km from the property. Holiday home La Maison Mer Et Thermes, a property with water sports facilities, is located in Le Boulou, 4 km from Le Boulou Joa Casino. Guests staying at this villa have access to a fully equipped kitchen. Providing access to a terrace, this villa comes with 2 separate bedrooms. A TV is available. Guests at this property can enjoy horse riding nearby, or make the most of the garden. Perpignan - Rivesaltes Airport is 34 km from the property. Featuring free WiFi, Auberge Du Chene offers accommodation in Maureillas, just 8 km from the Spanish border, 10 km from Céret and 39 km from Roses. The bed and breakfast has a barbecue and sun terrace. All rooms feature a seating area for your convenience. Breakfast can be served on the terrace or in the guest room. There is a gift shop at the property. Next door, you will find a restaurant. Cadaqués is 44 km from Auberge Du Chene, while Perpignan is 23 km from the property. Perpignan - Rivesaltes Airport is 31 km away and Girona-Costa Brava Airport is 55 minutes from the property. Bed and Breakfast Canohès Preferred hotel ! Located in Canohes, Chambres d’Hôtes Arcenciel offers an outdoor swimming pool, a terrace and bicycles upon request. Perpignan is just 5 km away and the A9 motorway leading to Spain can be found 3 km from the property. Accessed by a private entrance, all rooms feature a terrace, garden views, a flat-screen TV and a private bathroom. The kitchenette is equipped with a microwave and refrigerator. A continental breakfast serving fresh bread, pastries, homemade jam and seasonal fruit is provided each morning. Guests can find restaurants in the surrounding area. Canet-en-Roussillon and its beach is just a 30-minute drive from the property. Additional features include garden furniture, free Wi-Fi access and free private parking on site. Set in Céret in the Languedoc-Roussillon region, Les papillons en méditerranée has a terrace and city views. Guests staying at this apartment have access to a fully equipped kitchenette. The apartment includes a living room with a flat-screen TV and a DVD player. The apartment also features 1 bathroom with a shower. Hiking can be enjoyed nearby. Perpignan is 31 km from the apartment, while Collioure is 33 km away. The nearest airport is Perpignan - Rivesaltes Airport, 36 km from Les papillons en méditerranée. Featuring an outdoor pool, Residence La Source is a semi-detached holiday home located in Le Boulou in the Languedoc-Roussillon Region and is 38 km from Roses. Guests can benefit from a terrace. Free WiFi is offered. The unit is fitted with a kitchenette. A flat-screen TV is offered. Bed linens are not provided. Residence La Source provides free private parking available on site. Perpignan - Rivesaltes Airport is 35 km away. Hotel Relais des Chartreuses is set in a 17th-century Catalan farmhouse converted into a 3-star hotel, just 3 km from A9 Motorway access and 20 km from the beach. It offers a warm and friendly welcome in the heart of a natural setting. The hotel features 14 rooms and a suite. Each room is spacious and individually decorated, and features a renovated bathroom. Some rooms feature a private terrace. During your stay, savour delicious local specialities served on the terrace during the summer or by the fireplace in the dining room. Every dish is prepared with fresh produce from the market. Dinner is on reservation only. For your comfort, the hotel offers a small wellness centre and a swimming pool. It is a great base from which to enjoy the natural surroundings and the famous village of Collioure. Exit Boulou on the A9 motorway is just 3 km away. Set in Montesquieu, Maison entre mer et montagnes. Features accommodation with a terrace and free WiFi. Guests staying at this holiday home have access to a fully equipped kitchen. The holiday home is fitted with 2 bedrooms and a living room with a flat-screen TV and DVD player. Maison entre mer et montagnes. Offers an outdoor pool. Hiking can be enjoyed nearby. Perpignan is 32 km from the accommodation, while Collioure is 24 km from the property. The nearest airport is Perpignan - Rivesaltes Airport, 38 km from Maison entre mer et montagnes..
Grande maison catalane entre mer et montagne is set in Reynès and offers free bikes. The holiday home has mountain views and is 45 km from Roses. Offering direct access to a terrace, this holiday home comes with 5 separate bedrooms and a fully equipped kitchen. The holiday home also features a flat-screen TV, a seating area, and a bathroom with a bath and a shower. The holiday home offers a barbecue. Guests can relax in the garden at the property. Perpignan is 26 km from Grande maison catalane entre mer et montagne. Perpignan - Rivesaltes Airport is 29 km away. Situated in Montesquieu in the Languedoc-Roussillon region, Mas Les Romarins is a 4-star property boasting free WiFi. This holiday home has a garden. This holiday home is fitted with 2 bedrooms, a living room and a fully equipped kitchen. A flat-screen TV is provided. The holiday home offers an outdoor pool. Mas Les Romarins offers a barbecue and a terrace. Perpignan is 32 km from the accommodation. The nearest airport is Perpignan - Rivesaltes Airport, 38 km from the property. Situated in Camélas, La Briardière features accommodation with free WiFi and barbecue facilities. Each unit features a terrace with garden views, a fully equipped kitchen and a private bathroom with bath or shower. A dishwasher, an oven and microwave are also available, as well as a coffee machine and a kettle. The holiday home offers an outdoor pool. Perpignan is 21 km from La Briardière. The nearest airport is Perpignan - Rivesaltes Airport, 27 km from the accommodation. Located in Taillet in the Languedoc-Roussillon region, Mas La Rourède features accommodation with free WiFi. Fitted with a terrace, the units feature a flat-screen TV and a private bathroom with free toiletries. Guests at the bed and breakfast can enjoy a continental breakfast. Mas La Rourède offers an outdoor pool. A barbecue is available on site and cycling can be enjoyed within close proximity of the accommodation. Perpignan is 39 km from Mas La Rourède. Perpignan - Rivesaltes Airport is 45 km from the property. Featuring a garden, Chez Fati offers accommodation in Brouilla with free WiFi and mountain views. This property offers access to a terrace. The bed and breakfast comes with a satellite flat-screen TV. Guests at the bed and breakfast can enjoy a continental breakfast. When guests need guidance on where to visit, the reception will be happy to provide advice. Guests can also relax in the shared lounge area. Perpignan is 16 km from Chez Fati. The nearest airport is Perpignan - Rivesaltes Airport, 24 km from the accommodation. Offering free WiFi access throughout and an outdoor pool, L'Escalivade is located in Céret city centre. The Céret Modern Art Museum is a 5-minute walk from the non-smoking property. Each room here will provide you with a flat-screen TV. Some rooms have a balcony. You can enjoy pool and garden views from the rooms. The private bathrooms come with a shower, hairdryer and free toiletries. Extras include ironing facilities. At L'Escalivade you will find a garden and a terrace. The breakfast is served daily outdoors. Guests can enjoy local products and homemade jams. Other facilities offered at the property include a shared lounge. Free public parking is possible on site. Perpignan–Rivesaltes Airport is 35 km away. Set in Reynès in the Languedoc-Roussillon region, Casa Cantonada offers accommodation with free WiFi. A terrace with garden views is offered in all units. Guests can relax in the garden at the property. Perpignan is 33 km from the bed and breakfast, while Collioure is 35 km from the property. The nearest airport is Perpignan - Rivesaltes Airport, 39 km from Casa Cantonada. 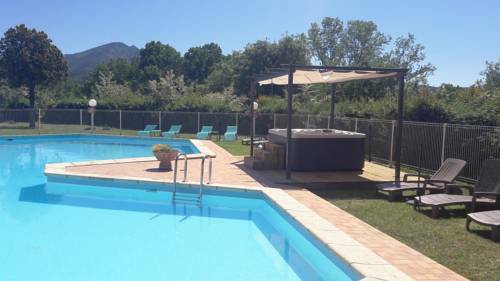 Set in Céret, Ta Maria offers self-catering accommodation with free WiFi. The property boasts a terrace and a garden, and is 43 km from Roses. The kitchen has an oven and a microwave. Towels and bed linen are featured at Ta Maria. Other facilities at Ta Maria include a barbecue. There is a public tennis court nearby. Cadaqués is 48 km from Ta Maria, while Perpignan is 26 km away. Perpignan - Rivesaltes Airport is 30 km from the property. Below here is the hotels map of Fourques. Names and details of Fourques hotels can be shown on the map clicking on the prices icons.